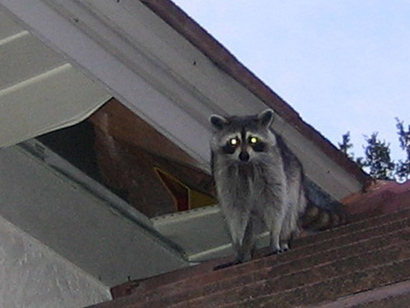 Raccoons - they make noises at night, and it's usually a female with young inside your house. Squirrels - they make noise during the day, and break into homes twice a year to have babies. Rats & Mice - it's important to seal every last entry hole, and trap and remove all rodents. Bats - a colony of bats in a house can be a complex case, with many tiny holes to seal. If you are ever in doubt, do not rule out hiring a professional to take care of your critter problems inside your house. With a bit of research you can find great pest removal experts at a reasonable price. You can also check with your local animal control office like the humane society or the fish and game office and they can give you suggestions or offer you free services. There are many repellent products out there for almost every animal, but unfortunately they do not work very well. The best repellents are ones that use the critter’s natural predator scent. But even these repellents will wear off and you will continually have to reapply them. Fences are one of the best options to keep any kind of wild animal out of your house or pest out of your yard. This is one of the most expensive options that you can take to get rid of wild animals, but it is the most effective. You can choose to enclose your entire yard or just your garden or the perimeter of your house. Whatever you decide to do with the fence, make sure that it is buried at least a foot and a half under the ground to prevent animals from burrowing under it. There are devices that you can use to try deter animals away from your house, even though they don't work very well, if at all. People believe wild animals are generally very sensitive to sounds, scents and movement in their environments and will run away from things they find unpleasant. There are ultrasonic sound emitters that most critters do not like as they emit very high pitched notes that irritate the animal’s hearing. There are scent emitters that are dependent on the animal that you are trying to get rid of. There are also motion activated sprinkler systems that are great in scaring animals away. These sprinklers are 100% safe and are very effective in discouraging animals from coming near your home or yard. However, you must strategically place them in places that the animal will be like the burrow under your house or your garden. How to get rid of animals in your house - the primary thing is to find their entry holes, and seal them shut. Professional grade steel repairs are best. You also need to remove the animals, of course. The appropriate traps or exclusion devices depend on which animal species has gotten inside your home. Wild animals are never fun or easy to deal with, but it is our responsibility to handle them in a way that is safe for you and the animal. If we do not handle these animals with care we can wipe out entire species. Whether they are a nuisance or dangerous, if you cannot deal with them safely, call a professional. Go back to the main Animal Removal page for more information about animals in your house. How do you get a animal out of your home? What to do if you have animals in your house. Wild animals are a part of life and we have to live harmoniously beside them, but what constitutes a wild animal? Wild animals are animals, rodents, reptiles or amphibians that have never been domesticated or that once lived in a domesticated home and now lives in the wilderness. A wild animal can be anything from a fox to a boar to a mole or even a stray dog. Just because an animal is wild, it doesn’t mean that it is dangerous. However, wild animals can end up being more of a nuisance than a danger.